Trying to be.� I have a bunch of recipes to post…it’s just finding the time to write them that is elusive.� Cooking certainly is not what it used to be at my house…there’s nothing fancy coming out of my kitchen these days.� But it’s real.� So hopefully I can get back into a groove with everything. I somehow missed that you were blogging again! I just signed up for email. The cheesy macaroni really doesn’t get much easier than this. And I say there’s nothing wrong with that because these days I take easy where I can get it. We love mac and cheese, so I’m trying this! Kitch, I have a sneaky feeling that I will be making this recipe quite a bit once Libby really gets into table food.� Hope your Minxes like it. I saw this title in my email box before leaving for work this morning. All day long my brain has drifted to macaroni and cheese. I’ve done this with leftover pasta, but I never thought to put in the flour to make it the real deal. Very clever! 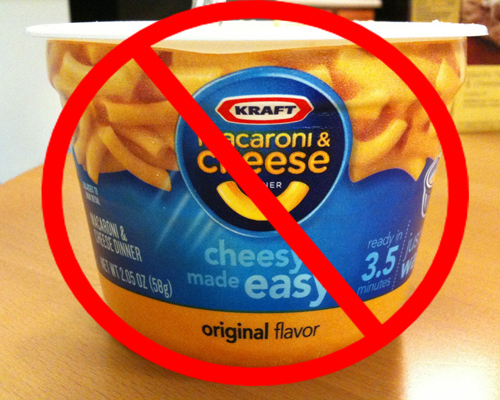 Bloody brilliant idea.� And here I thought that this was about as easy a recipe for mac and cheese as you could get.